Now to the fun part, when talking about deletion you must consider a little more than just this logic to determine the effective permissions granting a user to delete a Domain Admin user. Just to mention protected groups which can be read about here: AdminSDHolder pitfalls and misunderstandings. It’s a special set of high-privileged groups like Domain Admins, Enterprise Admins, Account Operators etc. 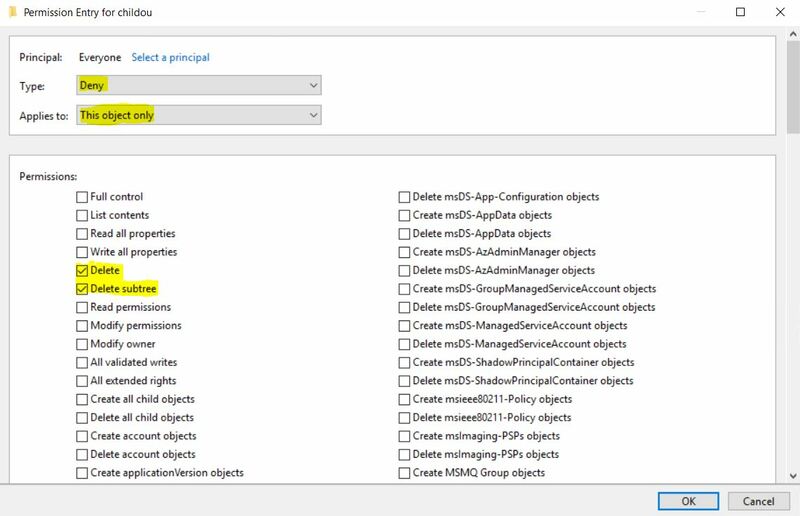 These have a special Security Descriptor held by the AdminSDHolder container and maintained by the AdminSDHolder background task on the PDC DC default every 60 minutes (nothing to do with SDProp: How the Active Directory – Data Store Really Works (Inside NTDS.dit) – Part 3 ). When a Security Principal or Distribution group is added to any of the protected groups the objects will be stamped with the Authoritative Security Descriptor from the AdminSDHolder containers nTSecurityDescriptor attribute. If it hasn’t been tampered with, inheritance will be disabled on the members, so it is solely relied on explicit permissions set in the DACL, right? As we can see it has a strict set of ACEs and basically its only DA, EA, BA and SYSTEM that has sensitive access to control these objects. With this quick glance we could assume you have to be SYSTEM (Domain Controller) or a member of the mentioned high-privileged groups to being able to delete members of protected groups, right? We can all agree that it would be dangerous if a lower privileged user could delete the most sensitive admin accounts, right? Just to make sure, we also have the Effective Permissions tab in ADUC where we can “analyze” what a user can do on a specific object. 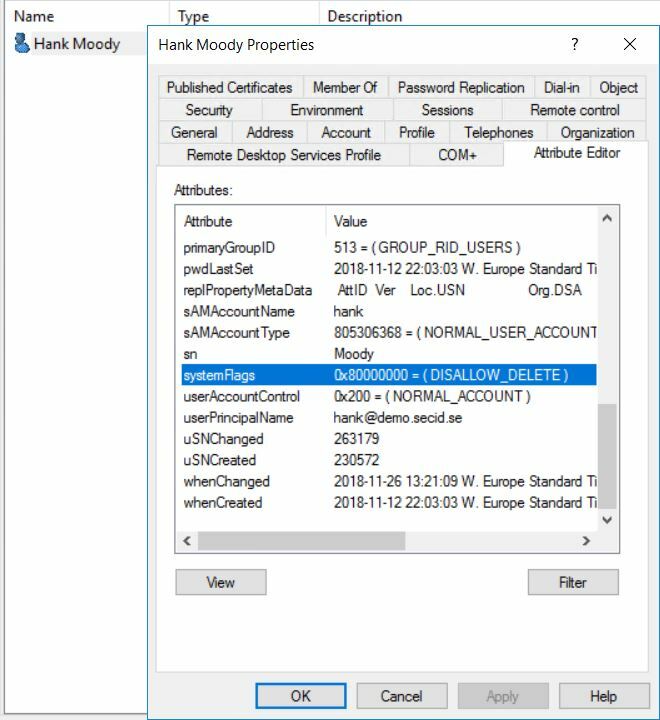 In this example we can see that Tony isn’t allowed much more than reading this object and its attributes and he isn’t allowed to delete the user account named Hank (that is member of Domain Admins). And here it gets interesting. When performing a delete action, the system verifies the security descriptor for both the object and its parent object before allowing or denying the deletion. An ACE that explicitly denies Delete access to a user has no effect if the user has Delete Child access on the parent. Similarly, an ACE that denies Delete Child access on the parent can be overridden if DELETE access is allowed on the object itself. 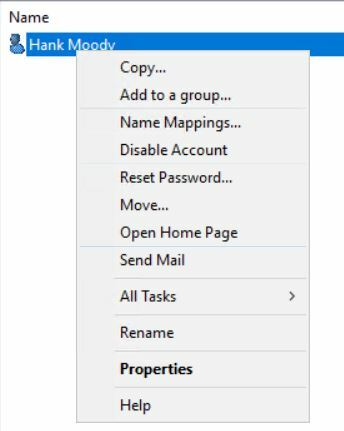 My admin user Tony don’t have the ACE: Allow Delete access on a Domain Admin user named Hank. Tony could still delete the account if he has the ACE: Allow Delete Child User on the parent OU. If an Explicit ACE: Deny Delete access is set on Hank. Tony would still be able to delete the account if he has the ACE: Allow Delete Child User on the parent OU. And if we reverse it: Tony ends up in an ACE: Deny Delete Child User on the parent OU, he could still delete it if he has Explicit Allow Delete in an ACE on the user object. So, with this we can see that the AdminSDHolder Security Descriptor doesn’t really protect the admins or nested groups in all scenarios. If you look back at the effective permissions picture, Tony had no rights on the user to delete it. 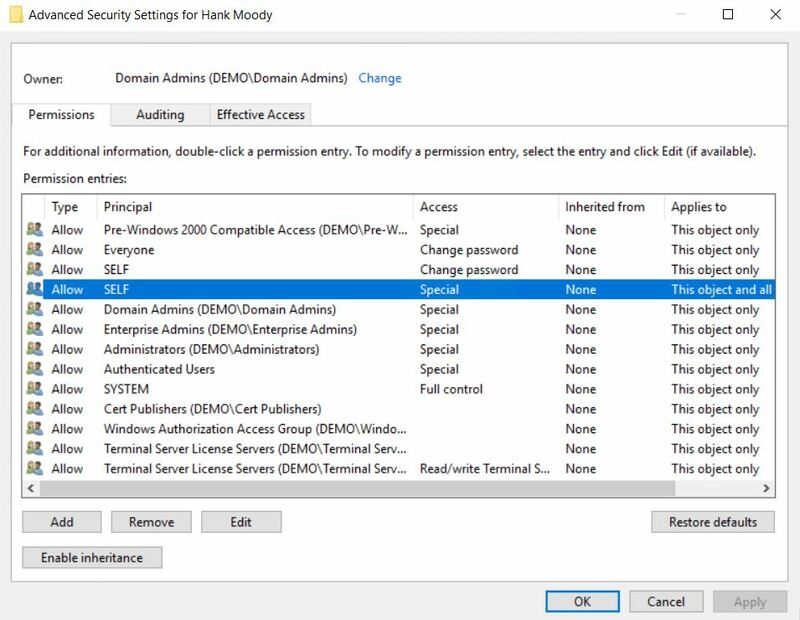 But he has the ACE: Allow Delete Child User on the parent OU and will be able to delete Hank which is a member of Domain Admins group. What about the Protect object from accidental deletion feature introduced in Windows Server 2008? 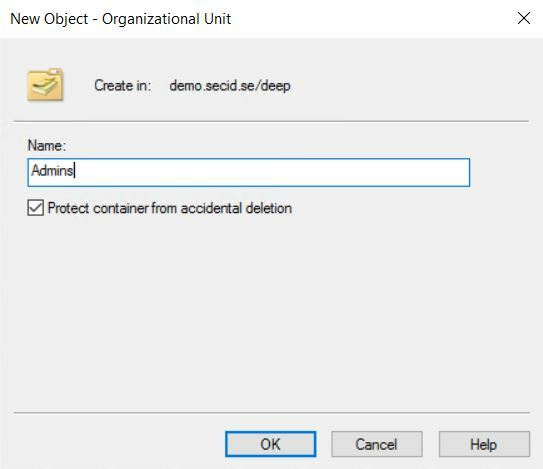 Default when you create a new OU in Windows Server 2008+ you get the tick box “Protect object from accidental deletion” checked on the object. What actually happens is that an Explicit Deny ACE is created on the object. Default it’s Deny Delete, Delete Subtree for the Everyone principal. The Deny ACE isn’t specified on the defaultSecurityDescriptor in the Schema for object class Organizational-Unit. It’s a feature in the management tools. It won’t be protected. So, it can vary dependent on how you create objects in your Active Directory environment if this is enabled or not. The other thing is how it works with the evaluation if a user actually can delete a protected object. As we stated earlier it depends on if it has an Allow Delete on the end object or Allow Delete Child on the parent. To add an explicit Deny for Everyone wouldn’t be enough, and that’s true. 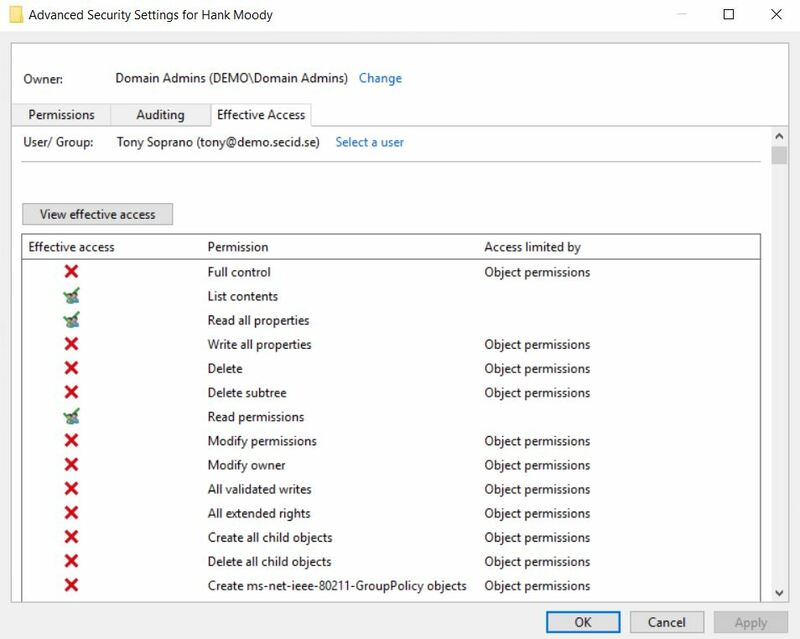 When enabling an object for Protection against accidental deletion it also adds Deny Delete All Child objects for Everyone on the parent OU if the user has access to modify that on the parent (Else he can’t enable protection against accidental deletion). This can create headaches if you for instance would enable this on an end user or group. If you have a delegation model configured a group is granted Delete child objects from that OU, they will now be denied that. And this ACEs can vary a lot depending on how you created the OU and what objects you have enabled this protection for (and delete child isn’t removed if you remove the protection from a child object). Will this help protect Domain Admin users? There are a few risks here. Since the DACL is derived from AdminSDHolder and that one isn’t default configured for accidental deletion the users won’t be stamped with any Deny ACE. The parent container CN=System,DC=X will get an ACE with Deny Delete All Child Objects for Everyone which maybe isn’t recommended. When the updated DACL will be updated on the members of protected groups, the AdminSDHolder process wont set that on the users’ parent container and this won’t be a good solution. Last, we also have the Delete Subtree access which is interesting. 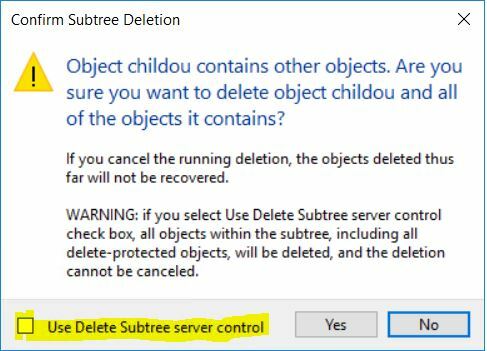 If we have deep OU structure and those are protected from deletion in any ways or if there are some child objects you don’t have any Delete/Delete Child access granted, we can make life easier and use the Delete Subtree server control. The LDAP_SERVER_TREE_DELETE_OID 1.2.840.113556.1.4.805 is a LDAP v3 extended control you can use to tell the DC in a delete operation to recursively delete the entire subtree of objects located under the object specified in the search request. With this function we can delete an entire tree and all we need is Delete and Delete Subtree on the top OU and then trigger the Delete Subtree server control and all the ACLs on child objects will be ignored. As you can see there could be a complex task to evaluate who can delete different object like Users, Computers, Groups and Even Domain Admins. It’s not enough to only evaluate explicit ACEs and inheritance on objects that has been propagated by SDprop, you also needs to evaluate explicit ACEs on the end object and the parent container. A malicious user can do a lot of harm and create a DoS attack just by deleting an entire tree. If he manages to delete all the admins as well, then you’re in a tough situation. Luckily one account that can’t be deleted this way is the Built-In Administrator (as well the DA/EA and other built-in groups). This account will be the one that saves the day in an emergency, and I hope you know the password that day. Now when we have talked about the delete access rights it could be a good idea to think about who has these powers default in Active Directory? Besides the obvious ones like Administrators, Domain Admins, Enterprise Admins we of course also have the well-known Account Operators group. Account Operators has default explicit Full Control on User, Computer, Group and InetOrgPerson objects. They don’t have that explicit access granted on the AdminSDHolder Security Descriptor, but they do have an explicit Create/Delete Child User, Group, Computer and InetOrgPerson on Organizational Units. 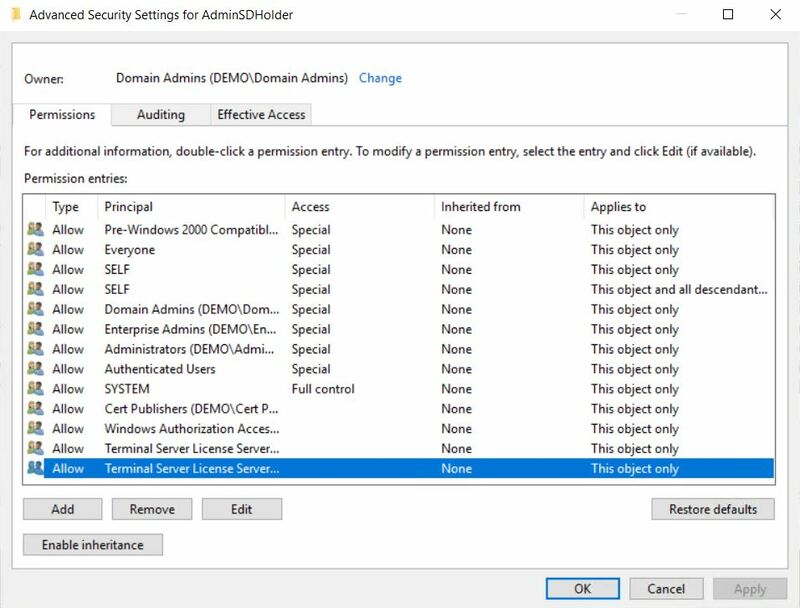 If the parent OU to the Domain Admins don’t have the explicit Deny Delete Child Users AO will be able to delete Domain Admin users. Another angle is targeting group nesting, if users has DA membership via group nesting just delete that group and they won’t be DA anymore. These are a few reasons why I want to have Admin OU separated as a Root OU to minimize the risks of faulty delegation. Create crystal clear Ownerships of the top OUs. The rootDNS object is of course owned by the DS/T0 team. Keep delegation close to the end objects and never use Account Operators. To summarize this, it could be a complex task to evaluate if a user can delete different types of objects. The three different Delete Rights isn’t evaluated together in the built-in “Effective Permissions” tool, this is one example that it isn’t enough to only look at the permissions granted on the end object, you will need to look at the explicit ACEs at the parents as well. This can be a nightmare in a complex structure with 18 years of bad ideas. Sorry, I just realized I’ve been only talking about explicit permissions here. So, I will add this: If Tony would have an Explicit Deny Delete Child Objects and Inherent Allow Delete on all User objects set on an OU, he could still delete users in that OU. A way to make the system ignore the ACLs is to use the systemFlags attribute and set FLAG_DISALLOW_DELETE, 0x80000000. If this is set on a user, you won’t be able to delete that user. You won’t even get the delete option in ADUC. And if you try to do a subtree delete it won’t be possible to delete the protected object. The sad part with this is that you normally can’t set that flag on User objects, I added that value with mimikatz DCShadow module and replicated that value in to the database. Just to see the behavior ? ← Password reset smart card only accounts – Why should I care?